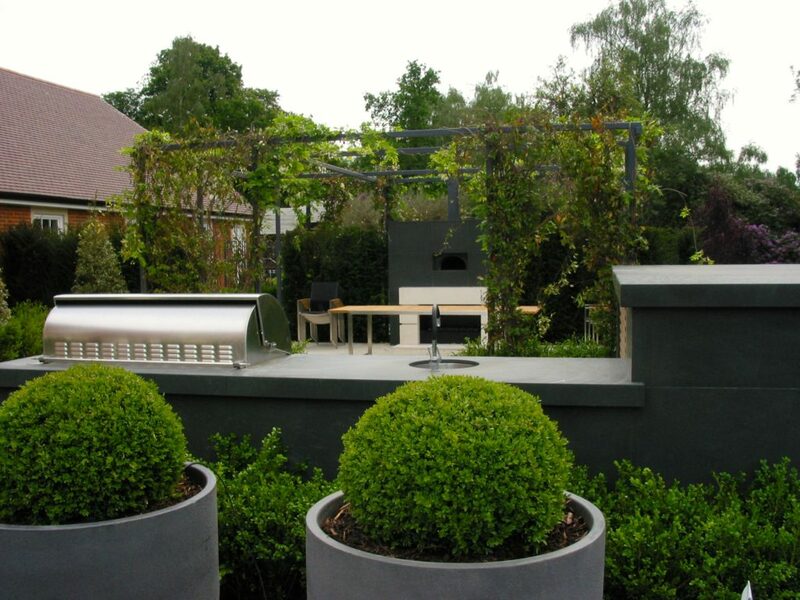 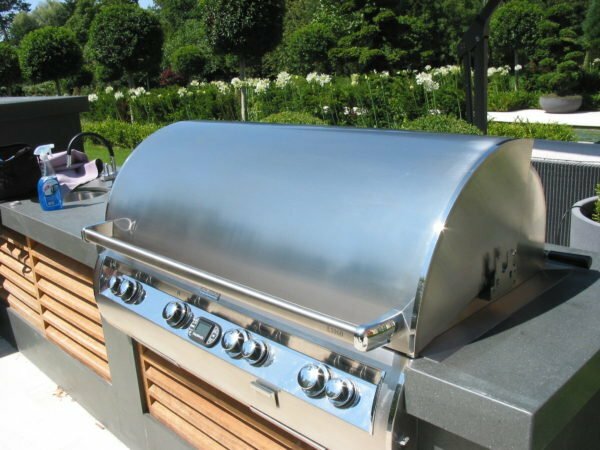 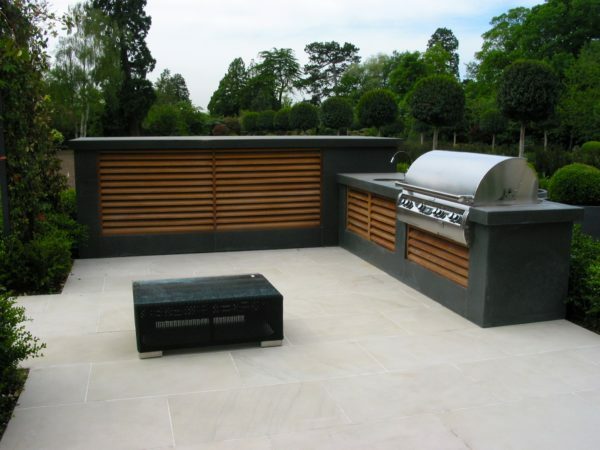 In 2013, following the success of our previous contract in St George’s Hill, Weybridge, we were contacted again by luxury house builder Octagon Developments to build an outdoor kitchen for a private client in an exclusive estate just outside Potters Bar, Hertfordshire. 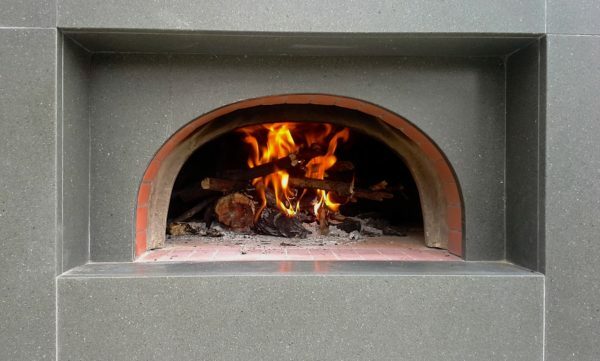 The plan was developed with Landscape Architect Cowley White of Wilkinson White from their site sketches and provided for a small wood-fired oven set in a stone clad enclosure with a gas fireplace underneath. 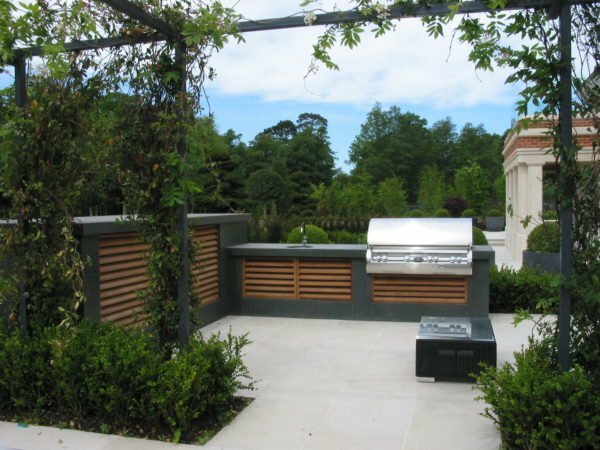 A separate L- shaped unit housed a large gas Firemagic BBQ, sink and cleverly disguised hardwood ventilation louvres for the underground car-park. 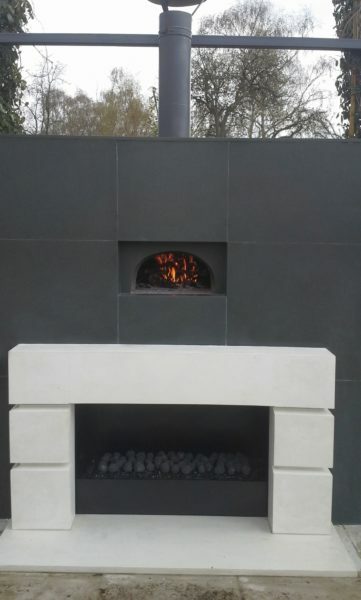 The Outdoor kitchen Potters Bar was a very smart scheme clad for us by specialist New Image Stone, in beautiful Basalt-like Pietra Matraia , a fine-grained grey stone that comes in large format slabs. The worktops had special glued down-stands giving the impression of 100mm thick stone, a nice way of giving weight and solidity to a surface. 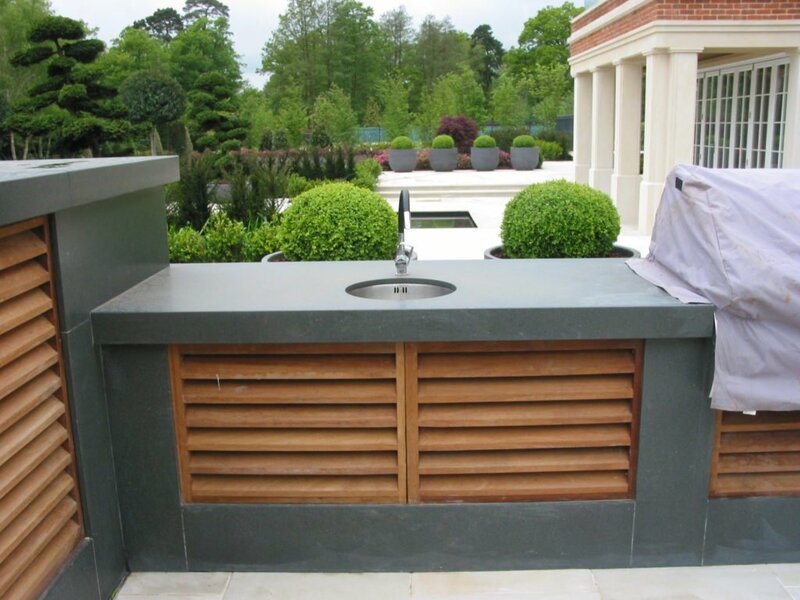 The stone went particularly well with the white limestone paving and FSC Iroko louvres. The gas fireplace was supplied by Urban Fires and fitted neatly under the enclosed Four Grand-mere 800 chamotte oven that we retrofitted with a small gas burner for convenience. 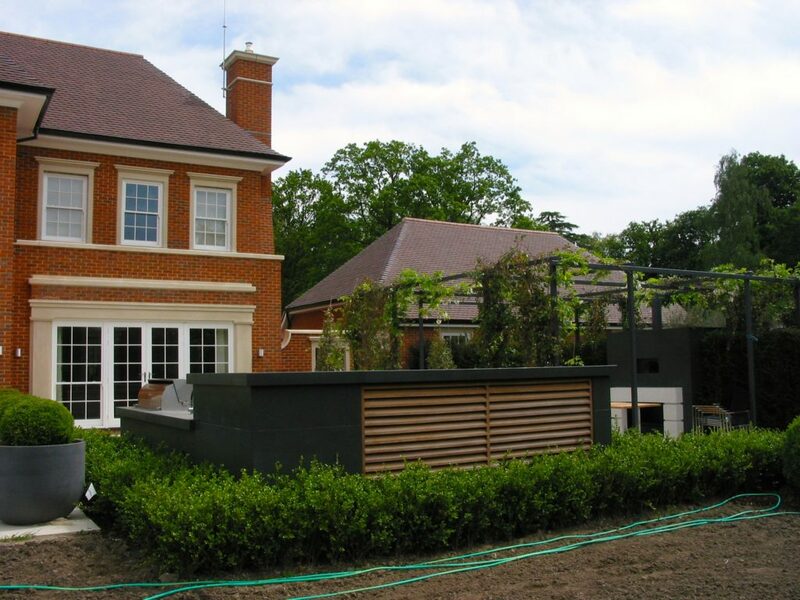 The project was handed over in early 2014 and sits very nicely next to the new-build house set in extensive grounds.